Anyone who has ever worked in a dairy milking pit for hours at a time will appreciate how wearing it can be - especially if the farmers and workers involved are past the first flush of youth. 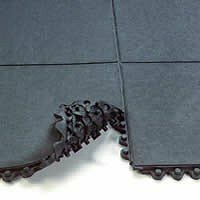 In order to be at the forefront of Occupational Health and Safety on farms, Dairyking is introducing modular anti-fatigue matting systems that it has found are providing very welcome relief to those suffering from the typical aches and pains associated with working on wet and hard concrete floors. Dairyking, one of the world’s leading dairy farm equipment manufacturers, has teamed up with one of Australia’s anti-fatigue and safety mats specialists, The General Mat Company, to help employers fulfil their occupational health and safety obligations - even in awkwardly shaped areas. One of its prime weapons in the war against bodily wear and tear is GMC’s 24/Seven™ modular mats, which provide supple, comfortable and secure footing 24 hours a day for people working in either predominantly dry areas (570 solid surface types) and in wet and greasy areas (572 types with drainage holes). A major advantage of the large (900X900mm, 15mm thick) modules is their ability to be cut to fit into areas that might otherwise be overlooked – such as L-shaped, T-shaped and squared U-shape floor configurations that abound in sheds, factories, warehouses, workshops and processing areas. “We have installed the product in dairies in the Hunter Valley and Northern NSW recently and have been encouraged by the interest it has created,” said Dairyking Sales Manager Philip Schultz. “We had one farmer whose Dad, aged 70, still likes to get down in the milking pit and do his bit. Because he suffered from the hard floors, he always had to get a chair to sit on. But since we put in the 24/7 Solid Top, he’s able to get through milking without needing to sit down”. General Mat Company Managing Director Mike Siegle says 24/Seven is ideally suited to primary processing tasks because of its versatility – “It’s more of a flooring system than matting – it’s that versatile,” he said, adding that the 24/Seven modular range also includes Gritworks modular mats offering up to 40 per cent extra traction and enhanced chemical resistance through their nitrile formulation. These are intended specifically for wet areas where optimum grip is required. The durable rubber mats – part of GMC’s new range of economical high performance mats for heavy commercial and industrial use – are modular designs that plug together via a hidden interlocking system to fit neatly into spaces of different shapes (around machinery, behind counters and benches, underneath workstations and in odd-shaped production areas, for example). “Without modularity and a substantially sized tile, these areas can be just too hard to do – not only do you have to fit around shapes, but you have to provide a tile that covers a decent area so you are not fiddling with dozens of flimsy little tiles,” he said. Featuring a knobbed underside to keep the mat firmly in place and with an optional 75mm wide bevelled safety edge for easy cart access, 24/Seven mats can be specified in 900X900mm single workstation size or in multiples to cover large areas. Customised mats are available in 300mm increments on standard sizing. In addition to conforming with relevant Australian HACCP requirements for food and food manufacturing, GMC has successfully subjected 24/Seven Solid and 24/7WH to the CSIRO’s tests for Slip Resistance Classification on New Pedestrian Surfaces. Detailed results of their high performance are available upon request. Model 24/Seven 570-Solid features a solid surface with pebbled texture for traction. Uses in mainly dry areas include stockrooms, serving lines, behind counters, machinery workstations, assembly and despatch areas. Model 24/Seven 572-WH, with holes for drainage, is suitable for uses ranging from food processing areas, canteens and kitchens, through to wet manufacturing, packaging and warehousing departments. Model 24/Seven Gritworks No 574 and 576 (with solid surface and with holes respectively) feature extra grip and a nitrile formulation that provides better chemical resistance than natural or SBR rubber products.